Tuesday morning. 5.30 am – my alarm is ringing. Not for an exam or job interview or similar. No! So is the alarm of circa 27.000 other students. Where other people go to bed after having gone out at night, we all got up to party and celebrate Valborg. 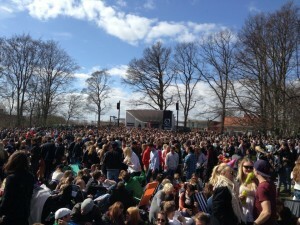 This is Valborg in Lund! Traditionally, the 30th of April – Walpurgis Eve, is celebrated as the end of winter and welcoming of spring, usually with big bonfires in the evening. More generally it is an occasion to get rid of old things (some might be burned on the fire) to make space for new things. Most of the students in Lund (and Helsingborg) however, meet at the big park in Lund for a gigantic picknick, with games, dancing and of course some drinking. It is crazy, dirty, loud, but a lot of fun (at least for some hours). And the whole park is so crowded, you easily lose your way. After a few hours, I felt like I had enough of people stepping on my blanket, spilling their drinks next to me and behaving like primitive animals 😛 Well, I guess with a higher alcohol level, you will enjoy it, too. Nevertheless, it’s something that you should not miss, when studying in Lund or generally visiting Sweden. 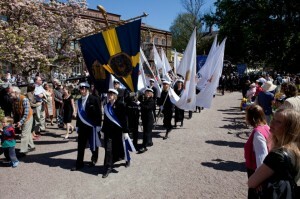 Students marching to the “rektorsuppvaktning” with their white caps on. But there are more things happening than just drinking and partying. Traditionally, the students also bring out their characteristic white caps and wear them during an evening celebration (“mösspåtagning”). This used to be at midnight, but in 1965 it has been changed to 6pm and now the students march with their caps and flags. The same and next day, you can visit quite a lot of concerts from choirs, welcoming the spring with their songs. Or as a student in Lund, you could join “rektorsuppvaktning”, where the students, represented by the president of the student unions, meet the director of the university and provide a ‘course evaluation’ of the academic year. Traditionally, all professors where evaluated and at the end of each speech the crowd would either shout “vivat” (he shall live) or “pereat” (he shall be killed), which of course would be a bit cruel in modern times. Still, it is used to express satisfaction (or not) with the previous year of studies. You can read more about this year’s speech here (in Swedish). The speech to the university director held by the union’s president. 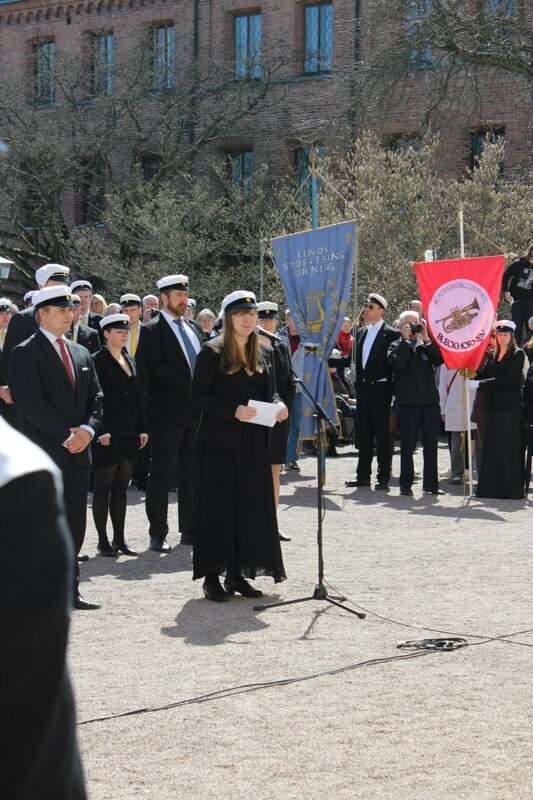 Det här inlägget postades i Absolut Student, Event, Intressant, Studentliv och har märkts med etiketterna Lund, mösspåtagning, rektorsuppvaktning, Valborg, walpurgis night. Bokmärk permalänken.